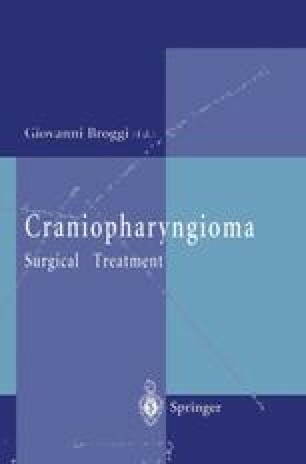 Treatment of craniopharyngiomas is still controversial, in spite of the unceasing improvements in neuroradiological diagnosis, neuroanesthesia, surgical technique, and pharmacological therapy. The complete surgical removal of the tumor is undoubtedly the gold standard (Guidetti and Fraioli 1979; Hoffman et al. 1977; Katz 1975; Lapras et al. 1987; Shapiro et al. 1979; Sweet 1976; Symon and Sprich 1985; Yasargil et al. 1990); however, sometimes this is an impossible goal to achieve, because of unacceptably high surgical risks. On the other hand, subtotal removal is associated with a remarkable incidence of recurrences; several authors advocate postoperative radiotherapy for these cases (Baskin and Wilson 1986; Carmel et al. 1982; Fisher et al. 1985; Guidetti and Fraioli 1979; Manaka et al: 1985; Richmond et al. 1980; Shapiro et al. 1979; Viramuthu and Benton 1983), but others argue against it because of “its unpredictable side effects”(Yasargil et al. 1990). Brachytherapy (Mundinger and Hoefer 1974), stereotactic radiosurgery. (Backlund et al. 1972; Backhand 1973b; Colombo et al. 1985; Leksell 1983; Valentino 1988), intracavitary radiotherapy (Backlund 1973a, 1988; Bond et al. 1965; Julow et al. 1985; Kobayashi et al. 1981; Leksell et al. 1967; Munari et al. 1988; Pollack et al. 1988; Strauss et al. 1982) and chemotherapy (Broggi et al. 1988; Takahashi et al. 1985), and drainage of craniopharyngioma cysts (Spaziante et al. 1989) have all been considered as an alternative or additional treatment to open surgery.